It’s a beautiful set! Prettier than expected. I thought the colors were perfect and the little unicorn pillow is the perfect touch. Nestle in clouds with the Urban Habitat Kids Bliss Comforter Set. The comforter showcases various cute and fluffy clouds in a colorful a palette of pink, aqua, and white. Within each cloud is a playful design that adds extra charm and dimension to the bedspread. The comforter reverses to a solid, soft pink. One pillow features all over ruching and the other features an embroidered unicorn. Made from 100-percent pre-washed, pre-shrunk cotton, this comforter set is hypoallergenic and bed-ready right out of the package. I purchased this comforter set for my niece. She absolutely love it and so do I. I love the beautiful colors. The colors are vibrant yet soft. I bought this for my grand daughters new "big girl" bed and was not disappointed! The colors are soft and fun while the unicorn and ruffle decorative pillows add a touch of whimsy. Very happy with the quality of this set! I am sooo happy I ordered this set. It is so nice looking... maybe better than the photos. I got a ton of compliments on it. My daughter is turning three and keeps screaming “I LOVE MY BED! I LOVE MY BED!” The package was ten lbs if that gives an indication of how heavy comforter is. It is way heavier than expected. Pillows are good quality and adorable. Very happy with my purchase! This picture doesn’t do it justice. It is adorable. My 8 year old made her own bed and I didn’t want to “fix” it and make her feel it wasn’t perfect. For me it is ‘cause I didn’t have to do it! All kidding aside we love this beautiful set. The pillows are adorable. A very nice touch. 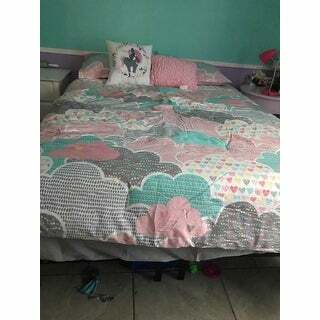 I was very satisfied with the quality of the comforter that I received! Comforter is cute. Not super thick/filled. No tears, rips. The decorative pillows were both poorly made though. Straight from packaging they had rips but I was able to get them sewed up. Received this comforter for my granddaughter just love it cant wait to see it on her bed. It was cute and my 4 year old granddaughter loved it! The colors are much more vibrant in person. Beautiful set! This was a gift to my granddaughter. She’s 8 years old. She sent me a picture of the bedding in her room and exclaimed that she loved it! My daughter messaged me that it looks better than in the photos and the quality is very good. The pattern is beautiful and the pillows were perfect. My daughter loves this set. Beautiful bed set , hopefully it’s what we are expecting to be !!!!! I’ll keep track of my review for updates for sure !!! Looking forward to see this beautiful set. "Any idea when a twin set will become available?"